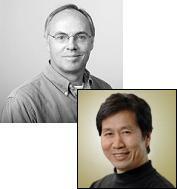 Linheng Li, Ph.D. (pictured bottom), Investigator, together with Hans Clevers, M.D., Ph.D. (pictured top), Director of the Hubrecht Institute in Utrecht, Netherlands, co-authored a prospective review that proposes a model of mammalian adult stem cell regulation that may explain how the coexistence of two disparate stem cell states regulates both stem cell maintenance and simultaneously supports rapid tissue regeneration. Adult stem cells are crucial for physiological tissue renewal and regeneration following injury. Current models assume the existence of a single quiescent (resting) population of stem cells residing in a single niche of a given tissue. The Linheng Li Lab and others have previously reported that primitive blood-forming stem cells can be further separated into quiescent (reserved) and active (primed) sub-populations. Emerging evidence indicates that quiescent and active stem cell sub-populations also co-exist in several tissues — including hair follicle, intestine, bone marrow, and potentially in the neural system — in separate yet adjacent microenvironments. In the review, Dr. Li proposes that quiescent and active stem cell populations have separate but cooperative functional roles. The new model would explain how the balance can be regulated between stem cell maintenance and simultaneous support of rapid tissue regeneration, not only at the individual cell level but also at the stem cell population level. The advantage of maintaining ‘zoned’ sub-populations of stem cells is to increase longevity of stem cells within organisms that have long life spans and large bodies. The existence of two sub-populations of adult stem cells offers another advantage in the rapidly regenerating tissues in mammals by reducing the risk for mutations that cause tumors. Intriguingly, cancers may utilize this same mechanism to maintain co-existing active-quiescent pools of stem cell sub-populations that support fast tumor growth (by active stem cells) while preserving the root of malignancy (by quiescent stem cells). This may explain the basis of drug resistance to cancer treatment. Illustration: Hubrecht Institute & Stowers Institute for Medical Research.